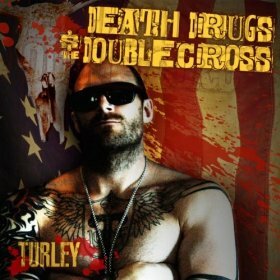 Hall of the Mountain King: Review: Kyle Turley, "Death, Drugs and the Double Cross"
Review: Kyle Turley, "Death, Drugs and the Double Cross"
I’ll offer a disclaimer at the beginning of this review. I’ve been a Saints fan as long as I can remember. I watched my first game toward the end of the Manning era when I was probably 8- or 9-years-old. Let’s just say there weren’t any thoughts of Super Bowls in those days. And that was the thing about Turley’s debut as a country singer. It was fun at times, but a little hard to take seriously. Even though I don’t think “Flying Helmets” is a great song, it gives me a big grin. The hard rocker “My Soul Bleeds Black and Gold” is a favorite for me for obvious reasons, and the Southern rocker “Another Whiskey” was not a bad song. But, despite those few moments, the record came off as a little amateurish. It often sounded like exactly what I thought at the time it was, an ex-football player trying to parlay his name recognition into a music career. The record did catch the ear of one of the notable personalities of the underground country movement, though, as Hank Williams III took Turley under his wing, taking him out on an extended tour and helping promote his music. He also ended up opening for the likes of country legend David Allan Coe and Southern rock luminaries Lynyrd Skynyrd. With his second album, Death, Drugs and the Double Cross, released late last year, Turley is beginning to find his niche as a musician, though. This album is notably heavier and features more rock. The distorted guitars of his heavy metal past come into play, though the music itself never veers into metallic territory. There’s a heavy influence of Coe, Skynyrd and Waylon Jennings on the record. More importantly, though, there’s a realness to the songs on this one that the first didn’t always deliver. The best songs here are a little darker, a little grittier, and you can feel them. It doesn’t hurt that the guy has a big, powerful voice to deliver them with either. The best of the six tracks on this record is “Cellar Door,” which opens with a dark, haggard acoustic piece very much in the vein of Coe, punctuated with a big exclamation mark of electric guitar, bass and drums. From there, it kicks up into a rowdy Southern rocker with more than a little Waylon. “We Ride,” which traces Turley’s travels from the NFL to country music, is a little more upbeat and hard-hitting musically, but in that same ballpark with some Coe-meets-Skynyrd stylings. “Dark River” has the feel of a newer Skynyrd ballad, but I also hear a little bit of The Cult in the mood of the verse and Turley’s delivery. It’s those mid-paced songs that blend country and rock that work best, but he does go full on Southern rock on a couple of tunes. “Smokin’” is an old-fashioned Southern boogie number, but when Turley unleashes his loudest wails, he reminds me a bit of Glenn Danzig. That’s even more apparent on the title track, which is the record’s weakest, though still not bad with a catchy chorus. I think the vocal inflection there is supposed to be Elvis, since the song references the King in the first verse, but it sounds more like Danzig to me. Of course, I’ll readily admit that could be because I’ve listened to a lot more Danzig than Elvis in my life. The most surprising performance on Death, Drugs and the Double Cross, though, may be the ballad “Fortune and Pain.” Turley drops the badass, black-sheep attitude for the song’s verse and opens up with some more personal lyrics and a more emotional delivery. It’s not as good as “Cellar Door” or “We Ride,” but it’s raw and real, and that makes it worth note. Is this an amazing, jaw-dropping record? No. Turley does oversing and stretch himself too far in places. But Turley’s progress from first album to second is notable. “Cellar Door” is as good as any country/Southern rock song I’ve heard in recent memory, and Death, Drugs and the Double Cross is a solid record from front to back. It will certainly earn a spot in my permanent collection. I have to admit that country music wasn’t what I expected from Turley’s music career, and at times it’s hard for me to match the voice on this record with what I saw of his personality in football. But this is pretty good stuff, and if he keeps moving forward, there might just be a promising career in Nashville for him. It sure as hell beats most of the stuff coming out of that town these days.